The Alpha Romeo Giulietta tells us ‘I am Giulietta’ at the end of its ads. French Connection’s blouses and bags proclaim ‘I am the blouse’ and ‘I am the bag’. 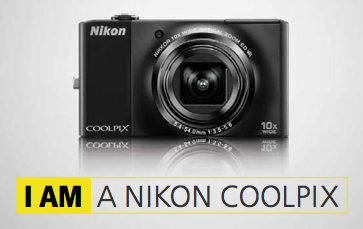 Nikon repeats the trope in its current campaign. And a recent ad for San Miguel lager reveals its narrator, at the end, to be the beer itself. They’re all examples of the rhetorical device prosopopeia – in which inanimate objects are given a voice of their own. A similar case is the Peugeot RCZ which ‘chooses’ and ‘owns’ its drivers rather than the other way round. It’s not strictly prosopopeia, as the car doesn’t speak in its own voice. But it’s in the same conceptual ballpark: the object or product becomes a living thing with subjectivity of its own. Of course, talking, animated products have been bouncing around at the ‘fun’ end of advertising forever – think M&Ms, Cheestrings and Peperami in the UK. But to find this trope in the serious register of high-end advertising might signify a bigger change. It could signal a break with the consumer-centred brand-led advertising of recent years – in which the subjective experience of the consumer is symbolically central. We know the story so well. Consumers are offered not a product but the return of their own authentic being: a chance to overcome alienation and find themselves in the brand – as in Nike, Dove, Coca-Cola, and countless other examples. But Peugeot, Alpha Romeo, Nikon, French Connection and San Miguel have all transferred subjectivity from consumer to product in their ads. San Miguel plays on the shift with particular awareness – leading us to expect from the ad yet another tedious and portentous first-person self-description, yet another expression of ‘who I really am’, before surprising us with its relocation of subjectivity in the beer itself. Perhaps what’s happening here is a reflection of technological advance – and the fact that products are becoming smarter, more intelligent and more sentient by the day. We’re already used to cars and devices that speak to us. Maybe we’re seeing the start of a new relationship between humans and products – in which we need to start listening to what they say. I find this very interesting, specially in contrast with the “educated” slave-like voice from Siri, the new personal assistant feature from iphone 4s. A dialogic form of communication between machines and humans -that “learns” from previous experiences and incorporates this learning in future interactions- was highly anticipated in the world of Sci-fi. It feels pretty familiar and easy to embrace just on time for the inclusion of a fully (beta) functional in this product. Maybe, integrated matching personalities, narratives and memories will be the main attraction for future iphone generations.